According to the report of the National Agency, among the higher education institutions established in 2006 and later, our university ranks first among 81 state and foundation universities in Erasmus + learning mobility ranking. Consultation Meeting of Higher Education Institutions Established in 2006 and later was conducted at Munzur University in Tunceli by the National Agency. In the consultation meeting where problems faced by institutions in implementing Erasmus + program, solution proposals to these problems and efficient use of internationalization and Erasmus grants were discussed, some numerical data on Erasmus mobility were also shared. According to the statement made by the representative of the National Agency at the consultation meeting, Karabuk University ranked the first among 48 state and 33 foundation universities in Erasmus + student learning mobility. 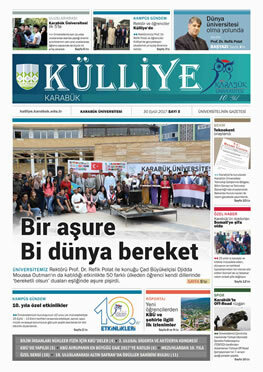 On the numerical data announced by the agency on the official website, as a result of the evaluation made according to the 24 month periods, our university ranked the first in student learning movement with 120 students, İstanbul Aydın University ranked the second with 109 students and Mehmet Akif Ersoy University ranked the third with 77 students. Erasmus program is a European Union program to encourage higher education institutions in Europe to engage in multi-faceted cooperation with each other. It provides gratuitous financial support as a grant to higher education institutions to be able to produce joint projects with each other and carry into effect and to exchange students and academic staff in a short-term. Higher education institutions of 27 member states of the European Union, and the countries that are not members of the European Union but members of the European Economic Area Iceland, Liechtenstein, Norway and candidate countries to become a member of the European Union Turkey, Croatia and Macedonia can benefit from Erasmus program.